Polar M600 is the waterproof Wear OS by Google™ smartwatch designed for fitness and sports. Stay connected while you train. Built on Google’s Wear OS by Google™ smartwatch platform, Polar M600 lets you make the most out of the ever-expanding world of Android Wear with apps for every need, including music**, health, lifestyle and community. Do you have an Android™ phone or an iPhone? Polar M600 with Wear OS by Google™ plays nice with both. Access thousands of apps via Google Play store – right on your watch. *Android Wear requires a phone running Android 4.3 or iOS 9. Supported features may vary between platforms. Visit g.co/wearcheck with your phone to see if it’s compatible. Designed for life. Optimized for sport. 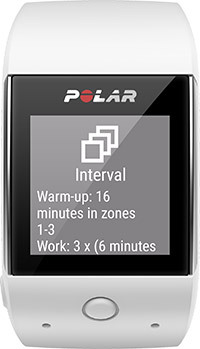 Polar M600 is a waterproof smartwatch that comes with Polar’s unique Smart Coaching features that turn your activity and training data into actionable insights. Polar Smart Coaching does the data-crunching for you so that you can focus on what’s important. Track your speed, distance and route with the integrated GPS and GLONASS. Track your 24/7 activity, steps, distance, calories burned and sleep. Enjoy a 2-day battery life when connected to Android devices. 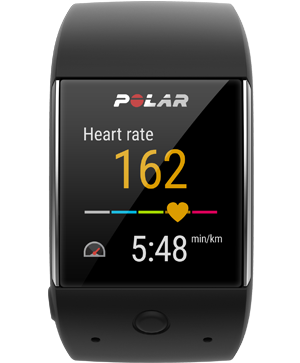 Train smarter with unique and exclusive Polar Smart Coaching features designed for sports, fitness and health. See notifications and meetings, ask Google for help and respond to messages – all on your wrist. Control music right from your watch. Go phoneless with Google Play Music** and 4GB of onboard storage for music playback. Wear OS by Google™ requires a phone running Android 4.3 or iOS 9. Supported features may vary between platforms. Visit g.co/wearcheck with your phone to see if it’s compatible. Android, Wear OS by Google™, Google, Google Play and other marks are trademarks of Google Inc.
** Music functionalities are not available in all countries. Here's what the media is saying about Polar M600. Quick answers to quick questions. 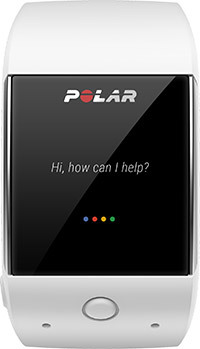 Can I use Polar M600 with an iPhone? Yes. However, battery life and smartwatch functionality is optimized for phones running Android. What is Wear OS by Google™? Wear OS by Google™ is Google's smartwatch OS that enables both Android and iOS users to access the Google Play store via the watch, download apps and operate them directly on the Polar M600. 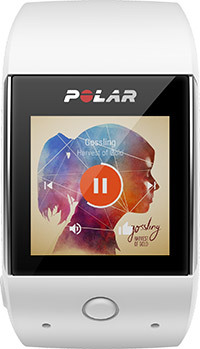 What is the Polar App? 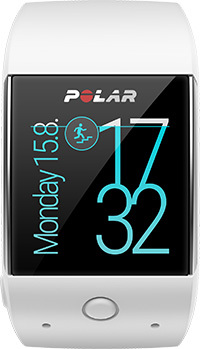 Polar M600 is a smartwatch. Smartwatches can run different apps, like the weather app, the calendar app or – in the case of the Polar M600 – the Polar App. 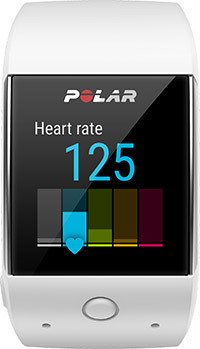 The Polar App is what opens up when you press the front button on the Polar M600. How long does the battery last with an iPhone? With the Wear OS by Google™ update, battery life with the iPhone should be better than the promised 1 day / 8 hours of training. Is the Polar M600 waterproof? 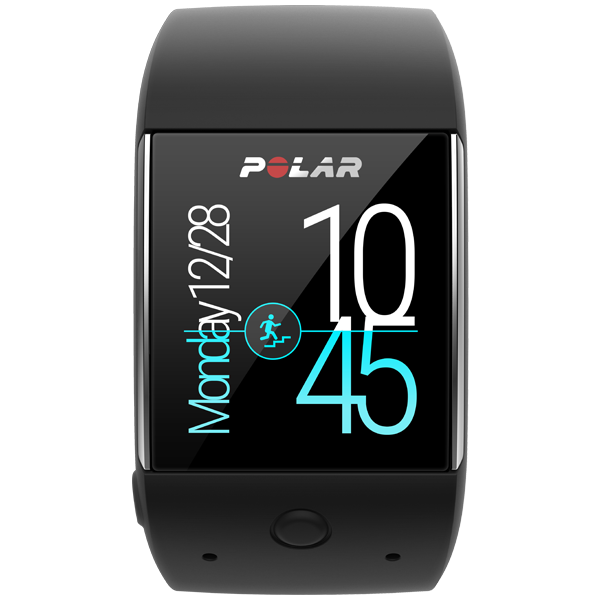 Polar M600 is suitable for swimming (IPX8).